Hi readers! 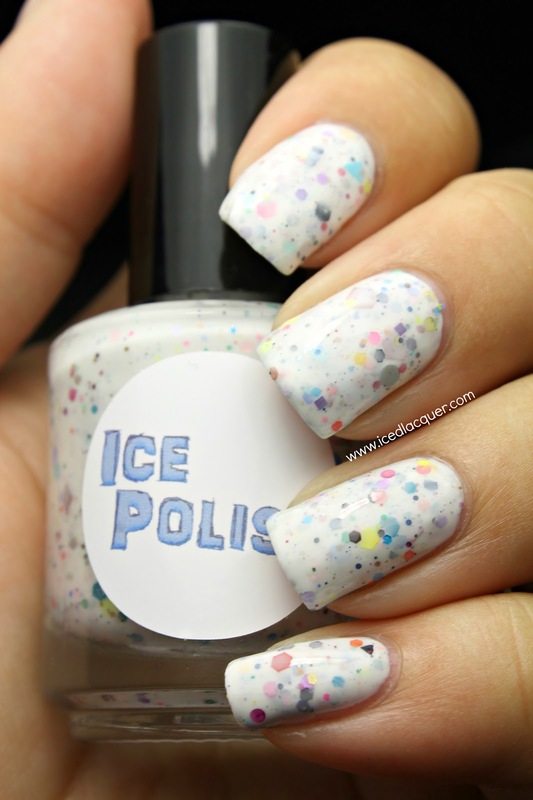 Today I have some fantastic new polishes from Ice Polish to share with you. These one-off mixes will be available starting on August 22nd at 11 am CDT. Let's go on to more photos! 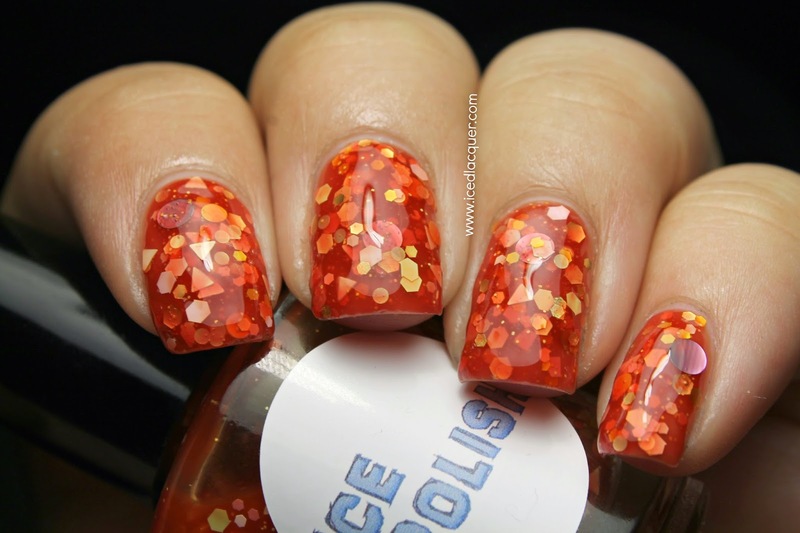 "Sunset Skies" - This red-orange jelly is filled with yellow hexes and triangles, gold holographic hexes, white hexes and dots, and large silver holographic dots. The jelly base is thin, but it surprisingly built up very nicely! These photos show three coats plus top coat. So squishy! "Peacock Be Trippin'" - This deep teal holographic is also loaded with tiny purple flakes. 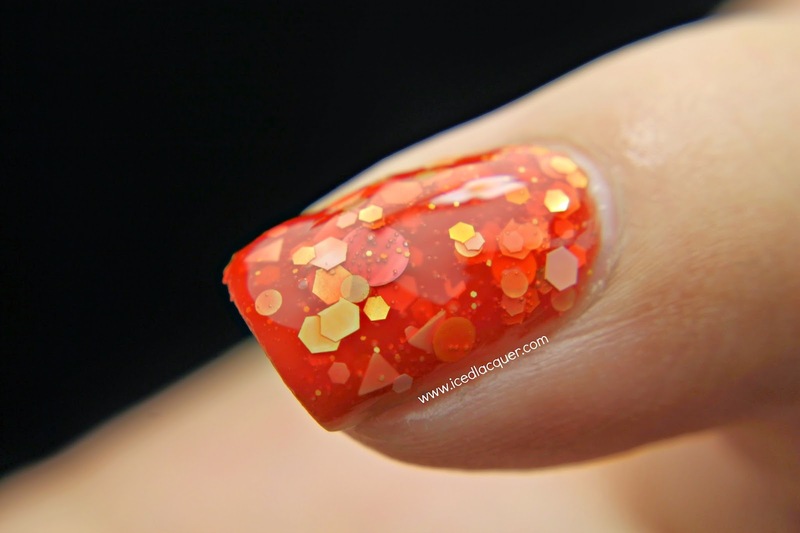 Beautiful color combination and a flawless formula, these photos show two coats plus top coat. "Mmm... Kale" - This black jelly base is filled with tons and tons of fine emerald shimmer as well as holographic, satin, and metallic hex and dot glitters in several shades of green. It's smoky, mysterious, and totally mesmerizing. These photos show three coats plus top coat. 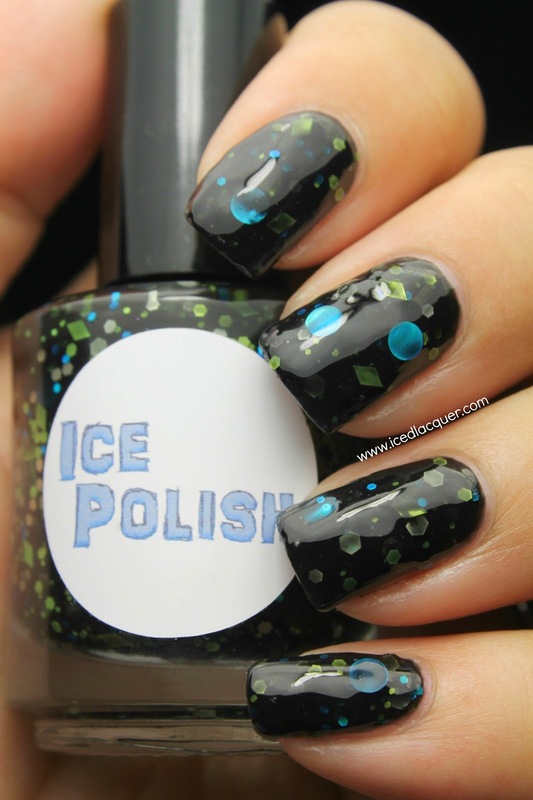 "Toothless" - Named after my favorite animated dragon, this polish starts with a black jelly base and is filled with lime green hexes and diamonds, pastel green hexes, and holographic blue hexes and dots. The formula on this was a tiny bit opaque and covered up a lot of the glittery goodness, but the wonderful Erin has already tweaked it so you'll be able to see more of those sparkles! These photos show two thickish coats plus top coat. "White Trash" - This white crelly base is filled with every glitter in Erin's stash! There's literally every color in the rainbow in this bottle AND THEN SOME! There's hearts, diamonds, stars, triangles, squares, hexes, dots, and probably more that I'm forgetting! These photos show three coats plus top coat. My thoughts? These five polishes offer so much diversity and uniqueness! "Peacock Be Trippin'" is especially gorgeous and I love the addition of the contrasting flakes. 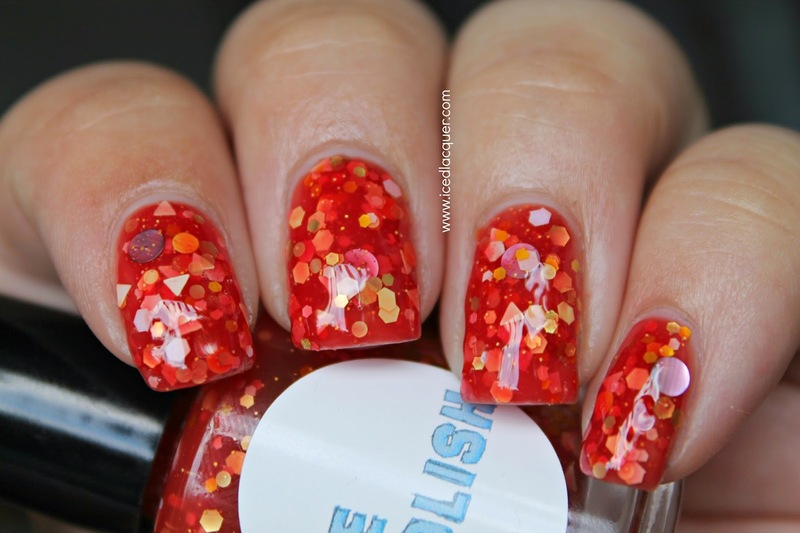 She knows how to make a beautiful holo! 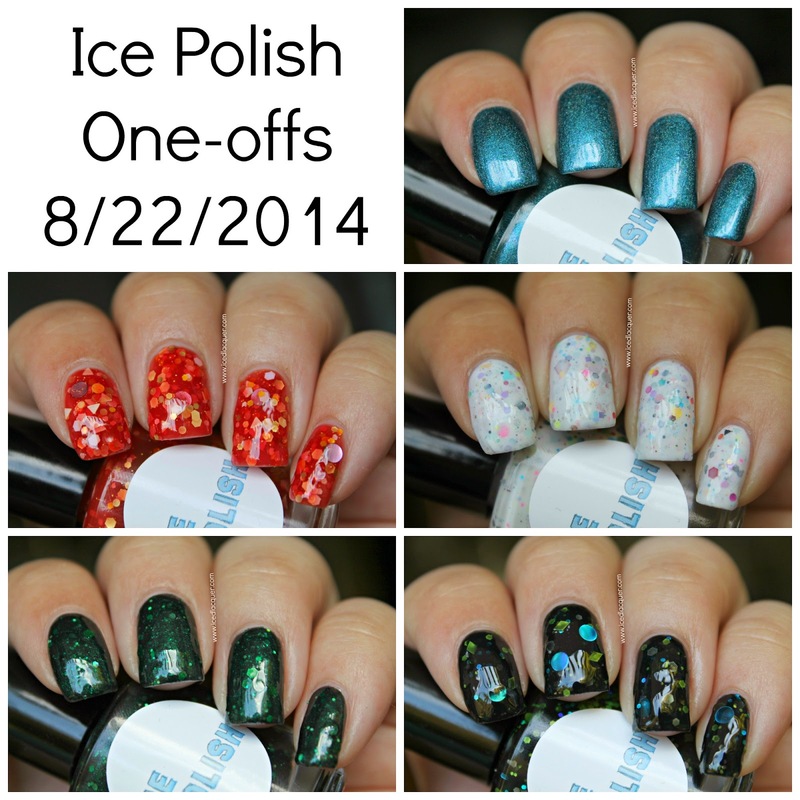 You can grab some Ice Polish of your own on Etsy and these five will be available tomorrow on August 22nd. 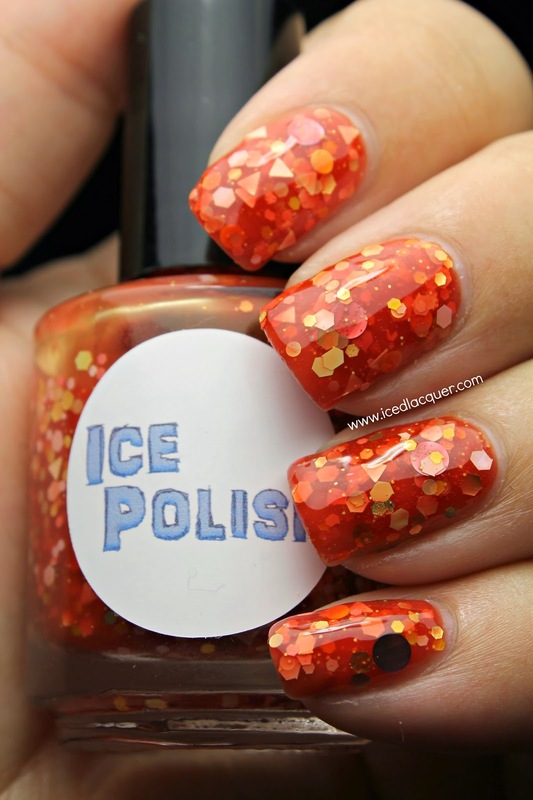 Make sure you follow Ice Polish on Facebook and Instagram for photos of new collections!